Bessie’s Hope (formerly Rainbow Bridge) began with a spiritual vision received by Linda Holloway, one of the co-founders. She heard a distinct voice repeating, “Bring them together, the young and the old”, and she saw what was to become the work of Bessie’s Hope. Inspired by her grandmother’s tragic nursing home experience and by the loneliness she observed in nursing homes, Linda, and co-founders, Sharron Brandrup and Marge Utne, worked to create an organization that would bring community awareness and participation into nursing homes. Sharron and Linda began taking groups of children to visit nursing home residents in 1989. Evidence of the life-transforming benefit to both populations led to the formation of a 501c3 non-profit corporation in 1993. In the summer of 1994, Linda’s and Sharron’s original musical entitled “Rainbow Bridge, an Intergenerational Musical” was produced at the Denver Center for Performing Arts. It attracted tremendous media attention, both locally and nationally. In the fall of 1994, the Rainbow Bridge volunteer programs were officially begun. People often ask, “How did Rainbow Bridge (now Bessie’s Hope) begin?” In 1989, my grandmother (Bessie) entered a Texas nursing home due to the progression of Alzheimer’s Disease. My grandmother and I had an unusually close bond. She had helped raise me and was always the constant throughout my life. As I made my monthly drive from Denver to Texas to visit her in the nursing home, I became consumed by anger, because of what she had to endure. Not only was she going through the horrid stages of the disease, she was suffering needless pain from neglect, drug abuse, and physical and emotional abuse that she received in the nursing home. Even before she developed Alzheimer’s, her life often had been challenging. Granny loved school and was very bright, becoming the teacher’s assistant at only 13-yrs of age. However, her dad abandoned the family, and she had to quit school to help her mother support four children. When she married, she quit work to be a homemaker. She raised a spectacular garden of many vegetables, along with fruit trees and beautiful flowers, always using only a shovel and a hoe. Her cellar was always full of her canning expertise. She also had a cow and chickens, so her work yielded most of the food. Being an extraordinary seamstress, she also made all of my mother’s clothes, as well as the clothes for herself and my grandfather, including his suits. She and my mother would go “window shopping”, because there was not enough money to buy my mother the clothes Granny wanted for her. When they would get home, they would have the material, and soon, my mother would have the dresses, just like the ones in the windows. When I came onto the scene, I too benefited from her sewing talent. In fact, I never had a “store bought” formal gown until I was in my 20’s and living away from home. Through high school and college, I told Granny what I’d like my gown to look like, and she would cut the pattern from a newspaper. We’d go look for the material I had in mind, and she would create the most beautiful formals I’d ever seen. Her old treadle sewing machine was never traded in for the new models, and she used it into her 80’s. When my grandfather left her, she again went to work, as did my mother at the age of 12. To make sure my mother continued her piano lessons, Granny made and sold beautiful quilts. Because they didn’t have a car, they took the bus to work, and they walked to the store and to church. My grandmother was a founding member of a Baptist church, and her faith was always like a light in the darkness. Sunday morning, Sunday evening and Wednesday evening meant church. Shortly after I was conceived, my father left my mother and me. We moved in with Granny, my mother went to work and Granny stayed at home with me. Entertainment was great then—radio programs, playing dominoes on a neighbor’s front porch, making home-made ice cream, lying on a blanket in the front yard and watching clouds create pictures, catching and releasing fireflies at night, making” mud pies—-. When my mother remarried, and we moved out, Granny went back to work. The last job she had was her true calling, and she remained in that job until she was 70. She became a nurse aide at a hospital and worked many double shifts, even triple shifts. Patients improved with her loving touch, friendly smile and gentle reassurance. Being a gifted poet, Granny would often send a patient home with his/her very own poem. 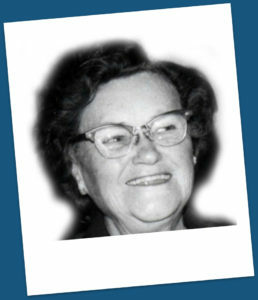 She made a significant difference in the lives of her patients and their families. My Grandmother and her house were like a fortress in a storm and a welcoming cookie jar for so many—from her own siblings and my grandfather’s siblings to her grandchildren and great grandchildren. She always had an ear to listen, a bed to rest in, and your favorite food to make everything better. Granny lived alone until her disease no longer permitted her to do so. It was with great struggle that my mother decided that granny needed to live in a nursing home. We were hopeful that she would at least have her basic needs taken care of and that she would be treated with respect. Even considering my mother’s visits almost every day, and my monthly trips to see granny, she could not avoid the tragic treatment she incurred in the nursing home. While in prayer one day, I was lamenting to God about “Granny’s” unfair life, when I heard a very clear and inaudible voice repeating, “Bring them together—the young and the old.” With eyes closed, I saw the work that would be Granny’s legacy. Sharron Brandrup and I began training young children to interact with nursing home elders, and we taught them our original songs about respect and caring. Marge Utne, the third co-founder, helped us launch an organization built upon the work we had already begun, which was the mandate from God to bring together the young and the old. Although she was unable to walk or feed herself or express her needs, one could always feel unconditional love glowing from her. Granny spent her entire life helping and caring for others, and death did not end this. She is still touching hearts and changing lives in profound ways. Her spirit inspired, created and will always guide the work of Bessie’s Hope, formerly Rainbow Bridge.